Celebrating their 10th anniversary, TVXQ (U-Know Yunho, Max Changmin) have come it at first place on ‘Inkigayo’. TVXQ appeared on SBS’ ‘Inkigayo’ on the 19th and came in at first place with ‘Something’, the title track of their 7th album ‘TENSE’. This was TVXQ’s first win on ‘Inkigayo’ with ‘Something’. With their win on ‘Inkigayo’ under the belt, TVXQ have dominated this week’s music programs, coming in at first place on Mnet’s ‘M! Countdown’ on the 16th, KBS 2TV’s ‘Music Bank’ on the 17th, and MBC’s ‘Show! Music Core’ on the 18th. TVXQ were able to win awards at every major music show in a single week with ‘Something’. This seems to reflect the power that comes from ten years of experience. 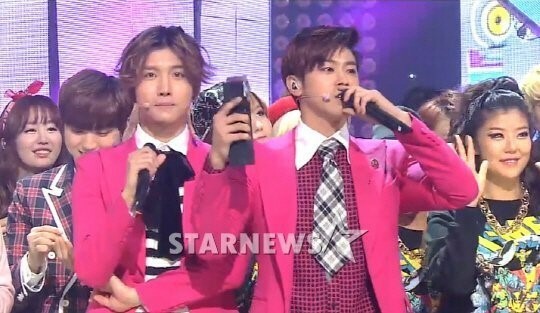 TVXQ thanked representatives of their entertainment agency when they received their award on ‘Inkigayo’. Meanwhile, TVXQ’s ‘Something’ combines a lively swing jazz song with a powerful dance performance.